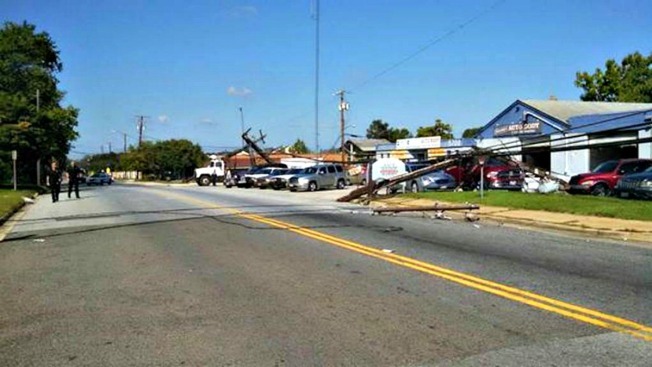 A dump truck collided with power lines and knocked out power to an area of Clinton, Maryland, Wednesday. Prince George's County Police said that at about 1 p.m. a truck collided with power lines on Kirby Road and pulled them down. The power was knocked out to several businesses in the area. No injuries were reported, but Pepco reported about 30 customers were without power. Police said they think an object in the back of the truck was in a raised position when the truck was backing out underneath the power lines, which caused the collision. Power is expected to be restored to the area by about 11 p.m.